A wickedly funny, honest, and poignant debut novel in the spirit of Then We Came to the End and This Is Where I Leave You about the absurdity of corporate life, the complications of love, and the meaning of family. "We're sold on Kenney's trenchant, quick-witted debut." "Kenney, who’s worked as a copywriter for 17 years, mines this rich territory for satire. . . . Fin’s struggle to understand his dad brings a layer of emotional complexity to the tale. . . . Kenney’s novel wrestles with deep questions: What makes a good man? What makes a good life? What should one’s contribution to the world be?" "Here's a smart one. . . . Lovers of the city will find much to love in this relatable, redemptive, and sometimes very funny story." "Hilarious. . . . Kenney mixes inside advertising jokes with the broad comedy necessary to keep those in the real world laughing." "What really amazed me was the unexpected depth and subtleness of the rest of the book, which showcases writing that, in terms of talent, puts Kenney in a league with the best of American writers of his generation." "New York-based Kenney . . . knows of what he speaks. He is particularly brilliant at clashing Fin’s jadedness with the unglamorous products he’s forced to pitch. . . . [A] delightfully caustic piece of satire." "A snortingly funny debut ... Although Nick Hornby is the obvious reference — humor and heartbreak of ordinary life — this wonderful book is more J. Alfred Prufrock." "With wry humor, always on point, Kenney guides us through the maze of work, family, love (elusive) and friendship (a lifesaver). This is an outstanding debut." "A masterful blend of wit and seriousness, stunning in its honesty. A novel sure to appeal to fans of Nick Hornby." "With wry wit, excellent pacing, and pitch-perfect, often hilarious, dialogue, Kenney has created something remarkable: a surprisingly funny novel about an adult American male finally becoming a man. Highly recommended." 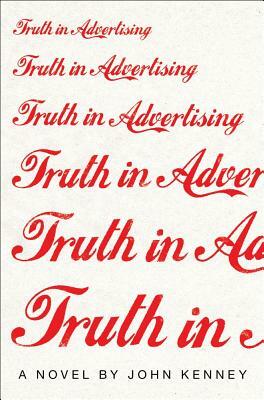 Truth in Advertising pokes fun at the advertising industry, yet often makes a case for it being an underappreciated art form. Do you think there is artistic value in advertising? Can you think of an example of an ad campaign or commercial that might be considered aesthetically important? Fin’s relationship with his father was volatile and complicated. Is it always necessary, or possible, to forgive those who have done us so much damage in the past? Is there ever an excuse for cutting ties with a parent? At different points throughout the novel, Fin has imaginary interviews with Terry Gross, Barbara Walters, and Oprah. What function does this device serve? Do you think it’s effective? Why do you think the author waits so long to reveal that Fin was present when his mother died? What does this revelation teach the reader about Fin? Do you think he was right to keep this secret to himself for so many years? In today’s media-saturated culture, individuals are often encouraged to “brand” themselves using Facebook, Twitter, and other social media networks. How would you define the difference between a person’s “brand” and their personality? What is Fin’s brand? Of all the Dolan children, why do you think Fin is the only one who agrees to scatter their father’s ashes? Is this act merely symbolic? Or do you really think it helps him resolve some of his anger toward his father? Fin notes that both Phoebe and Pam are friends who “understand what you mean, not what you say” (p. 232) Why is this important to Fin? Oftentimes tragedies bring families closer together. In the Dolans’ case, their father’s death initially just serves as a reminder of their troubled childhood and how far apart they’ve grown. What makes them incapable of finding solace in each other, and how do you think this has changed by the end of the novel? Fin frequently complains about being dissatisfied with his job, yet he remains unable to leave. What aspects of the advertising industry does he find so compelling even as he struggles to justify staying in it? He talks about advertising being based on mythology and lies. What are some societal myths about happiness and success that Fin buys into and why do you think these are ultimately unable to satisfy him? Phoebe and Fin play a game where they point out one beautiful thing they see each day. How does Fin’s relationship with Phoebe and the game they play affect the way he deals with his own anger and pain? Do you think there is beauty even in tragedy?